“A Thriver’s Journey is one where we stopped looking for love in all the wrong places. We stop looking for others to grant us love, acceptance and approval … or the fun, experiences and happiness that we weren’t generating directly within ourselves and with life. This was one of the greatest “gaps” that narcissists rush into ..
Then of course we were going to cling, we were going to not let go. We will prescribe, fix, maladapt ourselves, and do anything at all to keep this “source”. When all along this was about coming home to be alone with ourselves, to self-partner, to heal our gaps and become from the inside out a true Source of love and life to ourselves and others. To become the ONLY true relationship that would ever create true relationships with everything and everyone we choose in our experience. The only relationship that could or would deeply fulfil us. The essential relationship with ourselves. That is exactly the workshopping currently taking place with hundreds of people from all over the world right now in my next “3 Keys To Thriving After Narcissistic Abuse” Free Webinar Group. I have never written an article specifically on this topic – and I think it is really important that I do. Feeling “addicted” to the narcissist is one of the most horrible and powerless things about suffering the trauma of narcissistic abuse. And it truly does defy all logical explanation. People standing on the side-lines can’t comprehend it. It would seem obvious that you would want nothing to do with someone who continually hurts you. It seems incredulous that you’re not able to logically define that this person is no longer worth one scrap of your energy, and that you can’t simply stop thinking about them and move on. But – narcissistic abuse is anything but simple. Your friends and family may be incredibly frustrated seeing you go back to a horrendous abuser over and over again. Or that you can’t stop talking about the abuser and what they did. But these people are not chemically cellularly hooked – they’re not addicted, and there is no way they could understand the crippling pulls that are so overwhelming that it feels like you will actually die if you don’t reconnect in some way with the narcissist – even if only by thoughts. In this article I want to take you on the deep and truthful journey of addiction – what it is, how it plays out and how to break free from it. 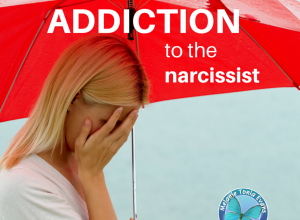 What Does Addiction to the Narcissist Mean? If we are addicted to the narcissist, fundamentally what it means is that we can’t stop thinking about him or her. The narcissist is front and centre in our mind to such an extent that we are finding it hard to have focus, energy or “space” for other things in our life. In this state it is incredibly hard to create a new life away from this person, and maybe we haven’t even got to any remote belief that leaving or moving on could be possible. We may be fruitlessly hanging on … trying to force this person to see what they are doing and change so that our anxiety can lessen. This takes the level of addiction and anxiety to another level – generally one of great despair and powerlessness, and as a result it may be nearly impossible to even perform basic self-care for ourselves. Or maybe, even though we are holding No Contact, it is like this person is still living inside us – and not in a nice way. The mental torment may be unbearable with the triggers of everyday life setting off yet another thought about this person. Thoughts about … what they did, how could they do that, why did they do that, how they should not have done that, how we could have done that, if only this had happened instead, and why didn’t I try that. And … what is going to continue to happen. We are terrorised about the past, feeling extreme anxiety in the present and completely disturbed about the future. You may be amazed how months, years or even decades later – even after the actual abuse has ended – how this person is still living inside you and your energy is being sucked dry trying to cope with that. You may not have laid eyes on the narcissist or even heard his or her voice for decades – yet you are still addicted to thinking about the narcissist. You may not have ever thought about this as an addiction – but I promise you it is. As you read this article, you will start to understand why. From my personal experience and having worked with many others, I have to say that addiction to narcissists is right up there amongst the toughest of addictions – I have had hard drug addicts tell me that heroin was nothing compared to beating narcissistic abuse addiction. I don’t want to tell you that to scare you – and make you think your situation is hopeless. I really want to tell you so you have the awareness to understand this is an addiction. Whether we are in contact with the narcissist or not, our eating and sleeping patterns may have become completely dysfunctional – we may be using all sorts of ways to try to ease the pain caused by the obsession and reoccurring triggers … such as cigarettes, food, alcohol, gambling, shopping, filling our life with social media and distractions …or trying to source comfort from other people in unhealthy ways. It is likely, within these choices of unconscious attempts to get relief, we are not connected to healthy strategies to look after ourselves and heal the addiction. Maybe we can’t even get out of bed the level of pain and despair is so bad. Maybe in utter self-disgust you have started behaving in ways that you never thought you would. Maybe you are incensed and angry and lashing out because people don’t seem to understand what you are dealing with in regard to the narcissist. Maybe you are lying about and hiding the fact that you are still in communication or seeing the narcissist. Maybe you are suffering alone because you no longer have the trust and support of those who could help you. Maybe things in your life are falling apart because you are falling apart. Maybe it has become impossible to hold down your job, and maybe friends, family and key people in your life are turning away. Maybe things have got so bad that you are virtually selling your soul for ANY bit of attention from the narcissist (good or bad) … akin to a drug addict licking the crumbs of powder off the floor regardless of the kicks to your self-esteem and life in order to get them. That level of addiction is horrible … to anything … not just narcissists. Addiction can kill people at this level – and narcissist addiction is no different. I was there … the addict from hell, falling deeper and deeper into a devastating addiction. It got so bad that I thought the only way out was to end my life. I believed I couldn’t live without him, and I was totally aware that living with him was killing me. It seemed I was doomed either way – and death would be the only release. Thank goodness I didn’t make that choice and I found the way to free myself … otherwise I wouldn’t be here writing this article to share what I learnt. What I do know is this: it is vital to admit you are addicted. If you are going through what I have described – I promise you in order to take your power back you need to stop pointing the finger at the narcissist and the crazy stuff he or she is doing – and you need to admit YOU ARE NOT WELL. Yes – you ARE addicted. And you need to stop putting the future of your sanity and life in the hands of what the narcissist is or isn’t doing – and take full responsibility to learn about your addiction, understand what is really going on and start healing it. I can assure you … if you wait for the narcissist to fix it for you, you are never going to get well, and your life could end up being destroyed. Because THAT is what addictions do. You may have been told by those who advocate victimisation that you are suffering C-PTSD and that this is normal after the level of abuse and trauma that you experienced. I promise you there is a much greater truth than this – and later in this article I am going to explain to you how “addiction” is the symptom, and how C-PTSD is the follow on symptom of your addiction – and this goes for you even if you have been able to hold No Contact and your symptoms persist. Your symptoms are NOT because of what the narcissist did or does to you – it’s the ongoing addiction cycle that you are not breaking that is causing your deterioration. I want you to understand and start looking at this in a very different way than most abuse forums would have you think about it. They want you to think that you have C-PTSD and that this will be with you for a very long time (if not for ever) because of the absolute horrendous behaviour of narcissists. No … I disagree entirely, and I have personally lived and facilitated a different truth thousands of times over. I want you to understand you are suffering an addiction and this addiction can be cured. And this means you will NOT have or suffer the ongoing symptoms of abuse. What Makes Us Susceptible To Being Addicted To Narcissists? Overcoming addictions, truly for me, was the hardest thing about my self-development – untilI really understood the truth about them. I had always had incredibly addictive tendencies. Originally it was alcohol, then cigarettes, then being a workaholic, then narcissistic partners. Absolutely “love addiction” was huge for me. I was a classic co-dependent. The profile being: highly intelligent, hard-working, capable … able to make most things in my life work. Yet, I was prone to seeking outside validation, and I was terrified about rocking the boat (feared abandonment, criticism or punishment if I spoke up) … and I had grave difficulty in trusting my intuition and my emotions. And rather than have the ability to solidly self-soothe I would go into overdrive trying to “fix things more” whenever I felt anxiety. In short I was often suffering guilt about what “I should be doing”, I had severe anxiety about my ability to survive and feel safe in the world … and I felt I was unworthy and unlovable without putting massive effort in to secure these things. When I couldn’t “do something” with workaholism and obsessive compulsive behaviour to relieve anxiety, I would use a relationship or another addiction to take up the slack – using those choices as an attempt to burn off the anxious feelings. 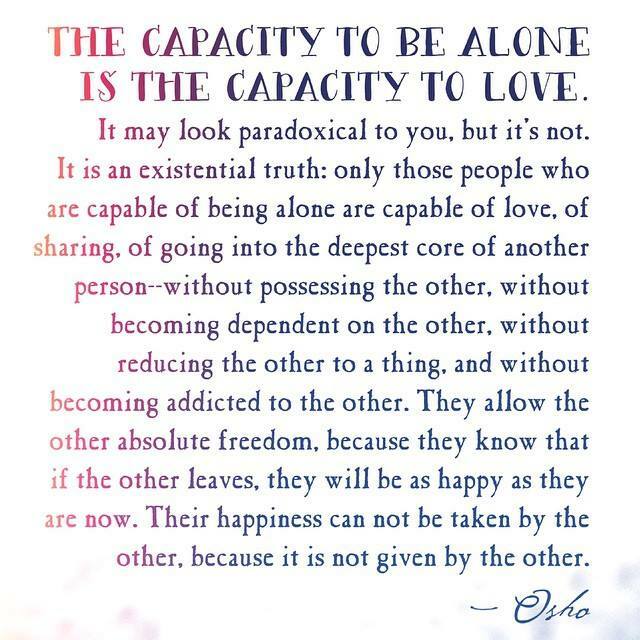 People who don’t suffer these “co-dependencies” (trying to get peace within “self” from outside of “self”) have a greater ability to be emotionally solid and self-soothe (much to do with early childhood programming) and are not as susceptible to making choices that will undermine their self-worth and value. They find it much easier to say “No” in the first place. These people are not apt to purposefully get drunk, smoke a cigarette, take drugs, binge on sugar laden foods, work 20 hour days or punish themselves by staying in an abusive relationship. I promise you I am not saying any of this to belittle you or shame you. I am saying this because this is the truth for most people who have been narcissistically abused. It was certainly my inner emotional life – 100% percent, and I had to take a great deal of personal responsibility to heal this, in order to live, survive and then thrive … which today I gloriously do. Mostly, I am explaining all of this from the inside out to educate you with a deeper understanding of what your urges REALLY are about – and how to not just hope to merely manage them (which can be excruciatingly difficult) but rather clean up the real reason they’re there in the first place. So that you are not just attempting to deal with the symptom (the addiction), but rather so that you can work at healing the real cause. This is the difference between merely surviving and truly thriving. The hugest thing to understand about the addiction is to know it is a “symptom” of trying to get the panic, fear or emptiness inside us soothed. When we are trying to get relief from outside of ourselves and are making choices from an inner state of “disconnection and anxiety”, the choices made will ALWAYS make the panic, fear and emptiness WORSE. This is the horrible cycle of addiction. It’s this … initial inner anxiety causing person to go for unhealthy choice as an attempt for relief … which then leads to increased anxiety. The “bizarre” thing about addiction that does NOT make logical sense is the relief channel (choice of addiction) is NOT effective. Let’s say someone has an addiction to sugar – which contributes greatly to obesity, existing fibromyalgia and chronic fatigue symptoms, self-disgust, lack of self-esteem and all sorts of issues … and even after KNOWING that, the person CRAVES more of it. The short term fix is relief from anxiety, yet like an itch than can’t be scratched, soon more and more sugar is needed. Immediate short term fix gets less and less, and requires more and more sugar to be experienced … and short, medium and long term damage gets more and more pronounced. The cellular body, chemically, is literally screaming out more and more “needily” for the compound sugar that is destroying it. So … why does our nervous, chemical and cellular system want MORE of what is obviously destroying it – and why is this spiral so powerfully compelling and why does it have such a deadly grip. How on earth is that LOGICAL? It’s not logical … and we are kidding ourselves if we think it is … and we are kidding ourselves if we think that we can SOLVE it at a logical level. Because this is NOT the level where all of this is taking place. How many people have tried to beat addictions with mere willpower? If THAT was possible TRULY addictions would not exist! Many, many people with addictions admit they would like to stop, but don’t. How many of us wished we had never picked up a cigarette? How many of us wish we didn’t drink again and behave the way we did? How many of us wish we had not made that sexual choice? How many of us wish we could JUST LEAVE an abusive person and NEVER look back? If we desperately want to stop an addiction and CAN’T – we need to admit we are POWERLESS over the addiction. Because we are! Science proves to us that we are! At the level of the cognitive mind we have a mere 5% power at our disposal as opposed to the 95% power of our emotional subconscious which is driving us to pick up the addiction of choice. It’s like trying to beat an elephant stampeded with an ant. So … back to “why” we crave more of what is destroying us. Forget logic – throw that out the window, because what I am about to explain has NOTHING to do with logic, and it has nothing to do with how intelligent you are. In fact the more intelligent you are, the less you will be operating from a centre of emotional intelligence, and the more you are prone to suffer from emotional addictions that you are trying to control logically. The most addicted, hooked people I have ever worked with (including myself) are the most intelligent for this reason – they are the people that are trying to work at their life cognitively instead of being emotionally connected to themselves. Imagine you eat a slice of chocolate cake that you were previously denying yourself. Now you feel an incredible surge of guilt – and maybe even self-disgust. You had promised yourself you weren’t going to eat it. You caved in … you had NO self-control and now you’re back to square one. You’ve just blown your calorie count. So … you beat yourself up … pretty severely. Then half an hour later – you have an even greater urge to go for another slice of chocolate cake. Now you are manically wrestling with yourself again – and your mind is giving you all sorts of reasons to give in. Why have you had this terrible downslide after telling yourself how horribly disappointed you were with your own behaviour after the first slice. Surely that would DETER you from doing it again! You cutting the second slice after that makes NO logical sense!!!! Okay – like I said – please throw away the logic because until you are willing to understand Life and yourself at a Quantum, energetic, emotional level you are nowhere near the truth. And this is NOT some New Age woohoo (as some people like to accuse me and others of) … it is actual science. If you do the research on the work of Dr. Joe Dispenza and Dr. Bruce Lipton (and others) you will discover how true and proven this information is. But really life should show you … absorb this information and then look at every aspect of your Life and you can’t deny that the irrefutable truth is all around you. Smacking you over the head. The reason that you went for a second slice of chocolate cake is because everything that you focus a lot of emotional energy on (good or bad it makes no difference) means you are saying a whooping great “Yes” to that thing. You have just cemented “that which you focused on” into your life as “your reality” and you have called forth “more of it”. Your huge energetic reaction to “having the slice of chocolate cake” completely and utterly set up the urges to create “having a slice of chocolate cake again”. Now … if you had made a decision to not have chocolate cake that was calm and solid WITHOUT the emotional beatups, traumas and chemical peptides being manufactured in your hypothalamus and being secreted through your bloodstream and absorbed by the cells of your body … then you would have been able to NOT have another slice of chocolate cake. It was your huge emotional reaction which set off a chemical chain of events – and what that was about was your unresolved self-judgements and self-loathing – that caused you to take actions that would cause MORE self-judgements and self-loathing. Because the cells of your body (addictive entities they are) would not have started chasing the massive chemical rush that you supplied them with 30 minutes ago. The high of the “trauma” of eating the first slice of chocolate cake was so “high” – that the “low” was a withdrawal, and the cells wanted the “high” to get out of that “low”. Your cells interpret any BIG chemical / emotional rush as a “high”. Please understand this … your cells are totally unconditional. Energy is energy – good or bad it makes no difference. I know when anyone complains to me about bad drivers or not getting car parks (especially when they have a BIG emotional charge wrapped up in their complaints) … that they suffer bad drivers REGULARLY and DON’T get carparks. I know that people who believe they are victims are CONTINUALLY victimised. I know that people who are not willing to look at life at a chemical level and are struggling with logic to try to change their life are fighting an uphill battle – especially if they are continually perceiving and relaying negative states of victimisation, anxiety, depression, powerlessness and trauma. They are addicted to these states, and unconsciously making choices that add to them. Let’s go back to the chocolate cake. The second slice came about because of the chemicals of trauma as a result of eating the first slice. So what do we think happens when we are stuck in the manufacturing of trauma regarding what the narcissist did to us? Be very aware … these traumas are MASSIVE rushes of emotions / chemicals to our cells. MASSIVE spikes … huge “highs”. I’ll tell you what happens – our cells chase more of it. So we continually think about what happened to us. And … we come up with all sorts of twisted excuses to make contact and touch the stove repeatedly that is burning us. Yep! The narcissist – even if that just means thoughts of the narcissist. I PROMISE you with all my heart – if I believed and knew that banging on about the narcissist and sharing war stories was helping us heal – I would be ALL for it! But it doesn’t … all it does is spread the poison, and create more peptide addiction and more abuse victimisation throughout people’s systems. It causes people to remain hooked, obsessing, going back, lining themselves up to be abused, and teaching their children how to be victims as well. Setting up future generations of more of the same. It does NOT break the horrible cycle, any more than repeatedly beating yourself up over eating chocolate cake does. It is the very epitome of cementing powerlessness and the addiction to pain and abuse even deeper. This is why RECOVERY is all about getting OUT of the addiction. People sharing war stories in abuse forums are deep in the addiction and are repeating the same stories years later… and they experience the same pain every day … even years later. They are literally addicted to the chemicals of grief, victimhood, despair, powerlessness, helplessness, anger and resentment. Take note, because if you are a victim of narcissistic abuse this is likely to be your orientation – until you realise what you thought could help you is NOT helping at all! Then … this is called “C-PTSD” and blamed on the narcissist mostly … and I understand this because I had C-PTSD, adrenal malfunction and agoraphobia through the roof at levels that I was told were medically impossible to heal and could only ever hope to be managed with permanent anti-psychotics. The truth – I discovered – bared no resemblance to any of that. When I cleaned up my addictions that were fuelling and feeding my trauma, and cleaned up the reason for the generation of trauma in my life … I was trauma free and on a trajectory of a completely different life. Then all of these symptoms vanished – completely – and I opened up to the organic state of radiance that we all ARE without these faulty states of living. Narcissistic abuse – and all that went with that – was then Not My Reality. And it does not need to be yours. So … we have looked at addiction to the narcissist (or anything) and how we are powerless to beat it at a logical level. In fact we are powerless to heal any addiction (and maybe can only ever hope to precariously manage the horrendous pulls and triggers) until we look at the true reason we are reaching for an addiction. The addiction is ONLY the symptom. There is a deeper CAUSE. The deeper cause is anxiety and emptiness being caused by an emotional wound – a young, precarious underdeveloped part of ourselves that feels unsafe and fearful. A part of ourselves that feels it needs something outside of ourselves to take away the pain. If we find and address this part of ourselves – there is NO addiction. At this point – I’ll share my story about breaking my addiction to cigarettes, because it’s an easy to understand example. I was a cigarette smoker since 15 years of age. A heavy smoker, and that addiction continued on even after narcissistic abuse recovery. Of course I wanted to not smoke, but I figured that was pretty much impossible – because apart from when I was pregnant (when smoking made me physically ill) I had only ever been able to stop for three weeks, and that had been excruciatingly difficult. That was until I remembered what I had learnt about recovery from my addiction to narcissists. I remembered the absolute truth: Cigarettes had NOTHING to do with my addiction to cigarettes! Cigarette smoking was only the symptom of how I was trying to get relief from the true cause. Therefore, all I had to do was find the true cause and heal that, and no longer would I be compelled to put a cigarette in my mouth when I really didn’t want to. Just like the narcissists, smoking was a horrible self-destructive choice attempting to self-medicate inner fear, pain and emptiness. So the answer to giving up cigarettes? Simple … stop the self-medication choice (smoking cigarettes) and fully be with, find, meet and up-level the wounds with Quanta Freedom Healing. So … once the light went on, and I realised cigarettes had nothing to do with it, I put the remaining cigarettes in my packet under a tap, threw them in the bin – and then sat with myself waiting for the anxiety to hit … now that the self-medicating drug had been removed. Diligently I dug into myself, deeply into my subconscious, and found significant wounds that were to do with loneliness, wanting connection, companionship and conjoining. These young, sad, depressed, “separated” parts of myself were craving connection and going for connection with cigarettes … something to “light up and connect to” … something to “keep me company” when these terrible feelings of deeply unconscious loneliness would hit. These wounds were so deeply unconscious that I didn’t even realise they were emotionally controlling me … (we usually don’t realise until we get in contact with our subconscious). So one-by-one I shifted every young wound of loneliness out of my body that I could find, and brought in the glorious warmth, love and connection with my Higher Power. I then passed this through to and filled up my Inner Child, and I integrated with her, and then conjoined with all of Life as “One”. These True Self feelings then became my emotional truth. I had re-programmed my subconscious. I promise you this … even in the midst of untangling and healing this stuff, (it took about three days) I did NOT have one craving for a cigarette – ever. I wasn’t even thinking about cigarettes – because they had become totally irrelevant – for the first time in 3 decades!! Cigarettes were done, because I was FULLY focused on nailing and healing the TRUE reason why I ever tried them or craved them in the first place. Now do you understand the truth about addictions? The first narcissist in my life was a horrendous addiction process that took years. The reason being was because I was trying to work at it from a victimised logical level, with no Quantum understanding or tools. Even personality disorder recovery specialists had no understanding of the chemical addiction and horrendous chemical withdrawal process that my body was going through. There was no information or processes available to deal with this, and believe me I searched far and wide. Looking back, I know I was undergoing withdrawal symptoms that made living sometimes a matter of survival minute to minute, which contributed to me breaking No Contact over a dozen times, and ended in my complete psychotic and physical breakdown which was so severe it almost ended my life. My life was going to end anyway the way I was headed – either through a self-destructive choice, terminal illness or an accident. There was no other way it could have gone because my addiction had spiralled completely out of control. Thank goodness I had my awakening and started seeking the real answers to recover – or I never would have. Second narcissist was a walk in the park regarding breaking the addiction to him. Straight away when I decided to end it for ever – I knew he was ONLY the symptom of deep inner wounds I needed to find and heal – and THAT was my full focus. The most significant wound regarding second narc was my total terror of abandonment. He had targeted a 3 year old wound that had been alive in my body since that age – an emotional unconscious fear that I would be annihilated if abandoned (which is exactly the emotional decision / terror I had experienced as a 3 year old). That narc played on it – and would belt and trigger that wound continually. I didn’t have to be an “Energetic Einstein” to work out this wound. It had played out horribly more times than I could count in that relationship. I knew the drill … use Quanta freedom Healing … look at what hurt, feel it in my body, track it, release it and up–level it (re-program it). Absolutely I went through days and weeks of deep healing, wailing out wounds and up-levelling them purposefully in order to detox the trauma and heal myself as quickly and as powerfully and directly as possible. Yet … NOT ONCE did I consider contacting him – want to contact him – or have ANY illusions that he was HEALTHY or desired in my life. I had ZERO attraction left. There was obsessional thoughts regarding the usual assortment of narcissistic lies, betrayals, adultery and obscene acts, which I needed to release from myself cellularly and liberate myself emotionally from … but not once did I wish that he was in my life. This made matters so much easier to heal than first narc – because this time right from the onset it had nothing to do with him – it was all about healing me. Second narc fallout was minimal; smearing and ongoing rubbish was non-existent and there was zero stalking, antics and drama. I know this is because I had changed so much; I wasn’t hooked, I wasn’t feeding it – I was disconnecting so fast, and I was claiming back my energy and my life so much more effectively than first time around. Before too long, I could go to any memory and it felt totally “benign” in my body – no emotional charge – because I had done such a great job of releasing it and healing it from my cells. Yes, I did have practical and financial loses again … but this time I was able to release and heal the regret so much faster – rather than being stuck in the victimhood and despair that I had suffered and regurgitated so much in the past with narc number one – which had delayed my recovery so much. My mission second time around was: no more peptide addiction to states that I FIRMLY did not want to experience or have in my life anymore – and that was never going to happen unless I released the poison and raised my consciousness to a level where they were Not My Reality. There was no other orientation to have if I wanted to break free and get well. With narcissistic abuse you have three choices. 1) Remain hooked (even if just with ongoing obsession) and get further destroyed by accumulating more panic and emptiness and an even greater addiction that will never be soothed, and will need greater and greater doses of the pain to try to get any sort of relief. It’s a spiral into a bottomless pit. 3) Make it all about yourself and all about reprogramming your subconscious so that you can break free from the horrible cycle once and for all. Then you will no longer be merely attempting to manage ongoing symptoms, but rather will heal at the real level that caused these symptoms.The Narcissistic Abuse Recovery Program is your absolute solution to achieve outcome number 3. I no longer have any urge for cigarettes, but this doesn’t mean that I choose to still occasionally smoke. They’re toxic; they’re poison. They have no place in my orientation of loving, respecting and caring for myself now. This is just a function of our ego – wanting to “appear a certain way”. The reason being: narcissists are Not My Reality. They don’t get any energy from me – ever. … that’s always unhealthy, unsavoury, soul-destroying and toxic. I wouldn’t pick up a heroin needle, or a crack pipe … so why would I pick up a narcissist again? It’s a lot to take it. Self-reflect this information and apply it to what you know about your life … and really think about and feel into how these states have played out in your life … and do the research about bodily chemical addictions – at a scientific level – if you want to understand more. When caught in the addiction … so often we make choices and get addicted to secondary addictions to try to escape the first addiction. This may be medication, another toxic relationship, or continual victimised narc bashing on abuse forums … or other choices that cause more disconnection from ourselves and more pain and are not dealing with the true reason for the addiction in the first place. That’s NOT living, and it is NOT the organic life of wellbeing that is our birthright to experience – when we take the path back to the truth. I want to help you achieve this – because it’s my life mission to help as many people liberate themselves from narcissistic abuse as possible. Over the last several months myself and my team have been working extremely hard to put together a revolutionary event, to give you the most important information and introduction to my healing system that I possibly can within a 2 hour time frame. It’s called the 3 Keys To Thriving After Narcissistic Abuse, and it’s going live on August 4th. If you’re still battling with any number of the symptoms of narcissistic abuse, I invite you to join me in this Webinar, because I will be showing you exactly how to transform yourself and your life …beyond even what you thought you were capable of before being abused. I teach you how to THRIVE. The event is totally free, all you need to do is invest 2 hours of your time. I hope this article has helped you a lot … and I look forward to answering your questions and comments.